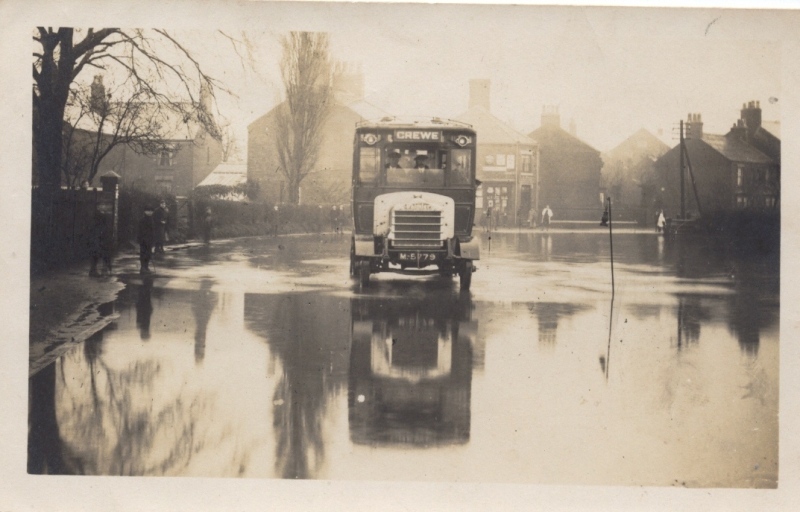 When the original Haslington Hall fell into decay its moat became a mere in the centre of the Village, giving Mere Street and Mere Bank House their names. Occasionally the mere flooded as can be seen here with Daimler bus (registration M-5779) driving through on it’s way to Crewe. Note the lanterns indicating the edge of the road. The mere was filled in and built on in the 1940s. So where was the original Haslington Hall, I thought the Hall set back on Holmshaw Lane and Park Lane was Haslington Hall for hundreds of years ? Was there another one ? The original Haslington Hall was built around 1220 on land that would now be directly south of and close to of the junction of Waterloo Road and Crewe Road. Old Tithe maps show the square mere or moat with land in the middle where the hall stood. The “new” Haslington Hall was built about 1545 or perhaps a bit later as it is said they used timber salvaged from the Amada in its construction.